Sandy 2012 has taken its toll on Fire Island, reminiscent of several major storms from the past, including Katrina, 2011. However this storm has proven the test of a dune practice set in place for over 30 years in Cherry Grove that resisted high ocean currents from over washing into the community and scooping away less than half of Cherry Groves dune fronts. With quick remediation efforts in clearing the dunes and installing dune fencing, already over one season sand burial has buried one and two rows of fences, with potential grass growth for the spring of 2014 looking more than prosperous. Why is dune fencing and grass planting essential? In residential communities where development encroaches the seashore, erosion and public activities undermine healthy natural dune growth. Grass cannot grow where footpaths are created. Storm erosion leading up to house fronts need further enhancement without grass addition and sand entrapment. A natural primary dune would have grass on hand to re bloom sending new root systems forward into the eroded region. On a residence where grass is depleted the process cannot begin again. 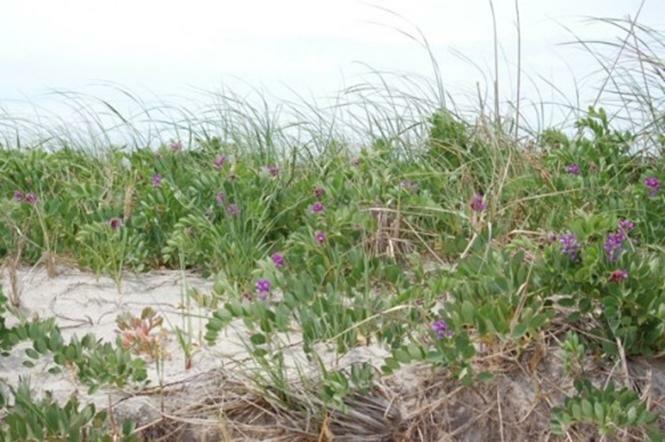 The Primary dune has a colony of pioneer plant species that thrive from and tolerate salacious winds and sea wash. Beach grass, pea-vine, and dusty miller are three major and minor dune plant stabilizers to our Northern Beach Grass Dunes that I have found growing on healthy dune systems of Fire Island. In my experience as a professional horticulturalist, on Fire Island these pioneer plant species are excellent for dune front development and rejuvenation. Dune fencing is an alternative sought out for residential areas along the shore where erosion, building development, and foot traffic prevent and furthermore damage the dune from continuing to prosper. 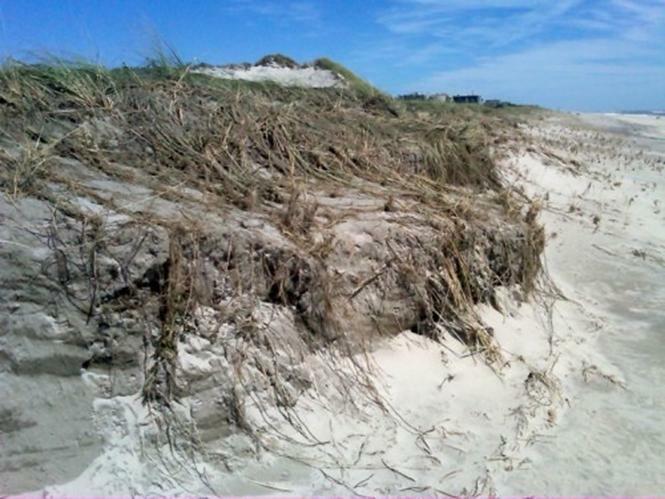 In order to achieve a primary dune, that protects the shore from bad sea storms and major out washes, dune fencing together with select pioneer plant development is your best strategy. Secondary to seaside dune development is lea-side dune shrub growth. I call the lea-side the “spine”, or the back-dune. It is another component to building a high dune with the fortitude to strengthen seaside growth. Ammophilia breviligulata-American beach grass- Seed blooms in the fall. Lathyrus japonicus-Sea peavine-Blooms repeatedly all summer. A healthy dune is full of beach peavine. 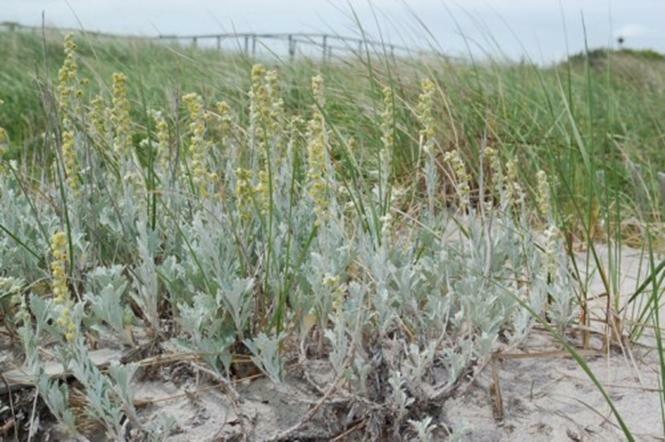 The primary dunes are high from years of beach grass growth, the most important pioneer plant on Fire Island. Beach grass combined with periodic sand burial creates a mound, or what I call the “Foot” of a dune. Basically these mounds are healthy fields of beach grass and pea-vine, plus several other plant species. The foot acts as a wind buffer for a back dune shrub-land to establish. The shrub-land adds more strength to the dunes physical and aesthetic presence on the sea, and its capacity to build higher, acting as the spine or backbone to the dune body. 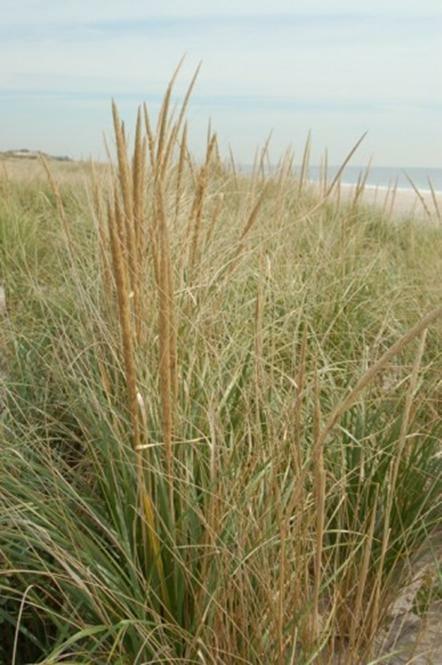 Without the seaside foot of a dune gradating high enough from years of grass growth and sand entrapment, a back-dune could not establish shrub-land plant species. I will further define back dune shrub-land plant species in my next blog, Lea-side Dune Shrub-lands. To continue upon primary dune building, the dune foot has two major contributors in its creation; growth and destruction. On the seaside, sand is constantly moving from wind and shifting east and west tidal currents; the two major contributors in creating the front of a primary dune system. Sand is carried throughout the season up and down the shoreline by the oceans current, then deposited on the beach and wind-blown into the grass fields where it is trapped and stabilized. Sea over-wash floods the dune grass periodically and can deposit as well as claim the sand throughout the year. As the soaked grass tufts die back from sea salting they decay, adding organic material to the dune structure. We know the dune is not made of pure sand but decaying grass matter and sand combined. The grass clumps will re-bloom, and the sand collects at the base of the plant and is trapped yet again. This process is constant. Over the years of average and severe weather patterns, coordinated with the grass and pea-vine growth, the dune foot inclines/declines with the wind and wave currents. Regeneration and degeneration is prevalent in the life cycle of a dune. In this image we can see the dune front eroded by sea over-wash from a hurricane in the summer of 2011. In the section cut away, the dense grass matter is revealed and shows how the dune structure maintains a high level of organic matter. In late fall, winter, and early spring, I have observed that the shore’s waves break much closer to the dunes than in the summer months. Many people, who arrive in the spring, comment that the beach was lost over the winter. It can seem quite dramatic when the beach is cut up with deep cliff-like drops up to 5 feet. The ocean has a wild way of removing sand and bringing it back month by month. But alas don’t be fooled, sand is always returned. However, if the dunes have suffered plant loss, the summer season will continue to wear them down. Rejuvenation is a process we can all take part in. How? In my observation one can see that the lowest point of the dune front starts where the highest point of the waves break during the off season months. 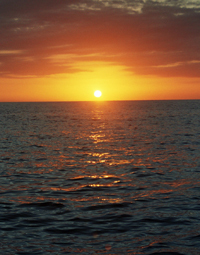 This is approximately 85 to 90 feet back from your average sea line. At this point the grade of the dune starts to rise as the grass beds thrive and build. 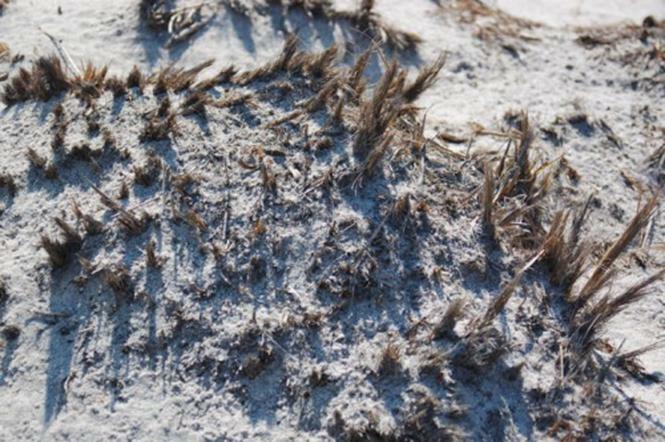 The decaying of grass and other plant material is key for the increasing of dune gradation. If the dune were only made of sand, we could simply pile up sand for our remediation efforts. One big problem. The dune would be moving constantly, shifting positions and not reaching the levels we see on a strong dune front that can resist high ocean currents. Sand pyramids for beach protection, are truly temporary without beach grass layered within. Buried grass adds body, weight, and moisture to the dune, as well as important fungi and essential bacteria that the beach grass thrives on. Decayed matter to sand ratio, is essential for good grass growth. Once footpaths and erosion takes place, the dune is compromised and can take years to re-seed on its own. 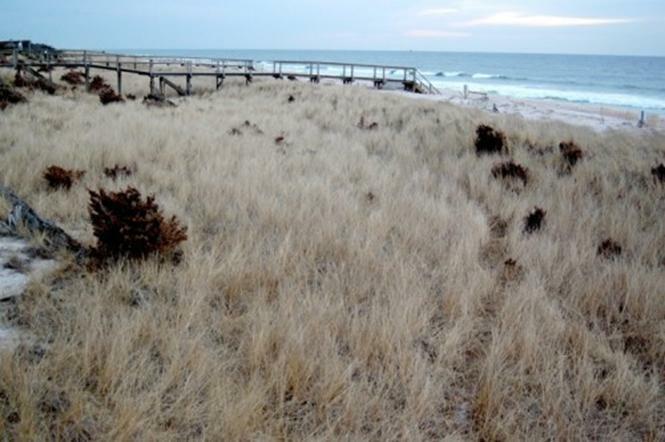 Continual beach grass seeding and planting is essential, along with dune fencing, to rejuvenate eroded dunes in residential shoreline areas. The grass dune, when lush, will mound up to 5 feet, allowing the high dune to evolve in tandem with a back-dune shrub-land, supporting the high dune growth. A solid dune reaches a height of 18 feet and greater. 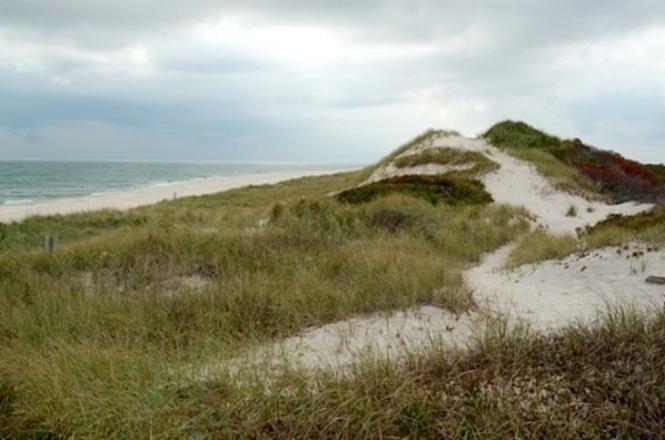 The dunes are bio-engineered structures natural to barrier island and coastline topography. Natural dune structures have been studied and can be modeled for dune regeneration practices with excellent success. Dune regeneration in front of residential development on the coastline need to apply grass and fencing strategies to overcome residential development of what would naturally occur on the national seashore over time. Given winter current activity, chances are there is not enough room for a dune to establish where a house has been built into the typical dune line. It may be possible to achieve a grass bed with a dune front up to 5 feet in depth. I have seen grass beds form on the shore where the original dune line is crowded out by a seaside house or pool front property. These grass beds need to last and should be replenished when a big storm hits with yearly grass plug plantings, fertilization, and dune fences set in place at least four times a year. Thus the farther back a healthy dune, the better it stands a chance against big storms. 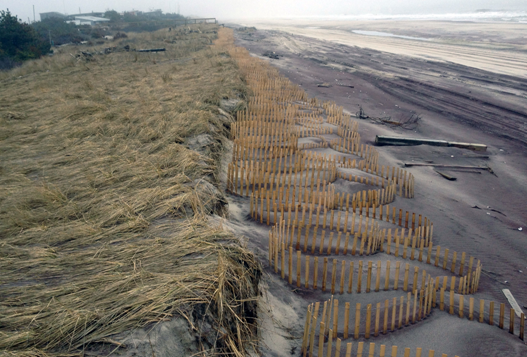 Dune fencing is a system to help erosion from tearing down the dunes. Foot and car traffic on the beach, major storms, and tidal currents, are all examples of erosion causes. Dune fencing is helpful to maintain these major shifts, but without the basic pioneer plants to trap and hold down the sands, a dune will not grow. Growing up on Long Island, I have spent my whole life exploring the north and south shore beaches. I have seen several ways to execute dune fencing. Dune fencing’s best overall design by far, is the serpentine style. Serpentines structural form is laid out to curve in such a way that it would stand on its own, even on a hard flat marble floor. A 2 foot or 4 foot fence is hammered into the sand on any beach with a gradient or grass deficit. 2 foot fences are created by sawing the 4 foot fence in half, while it is still in the roll form. In the summer months I have seen sand reach the top of a serpentine fence. The fence installed in the spring or even as early as in winter months, and will collect sand in the summer, allowing time for another row to be installed in the summer and fall. This increases the dunes foot for grass plugs and or seeding, and allows nature to take its course. The desired site of your first row of dune fencing to be achieved is approximately 85 feet from the average sea line, defined by winter wave activity or the storm erosion line seen in the dune. Sand build-up is the key in allowing the primary dune to evolve through all of its stages over time to reach its full capacity to protect from storms. Storms that wipe away a fencerow and erode the dune front can be fixed quickly. With new fencing rows installed, the sand will come back and reshape the dune front before the next season. By following up with grass seed or plugs every early spring, the dune is back on track. 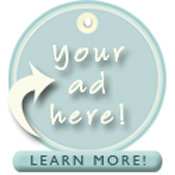 The method is a proven strategy that works. If the fencing is not serpentine, but a wide V shape, it would fall down on its own. I have seen 2 x 4′s substituted for structure as stakes. The 2 x 4′s weigh it down and if the sea reached the fence, they would take down the fence prematurely, possibly within weeks of installation. Sometimes too much structure is overkill. The serpentine form is self supporting and proven to work along the North East Atlantic coast for hundreds of communities. 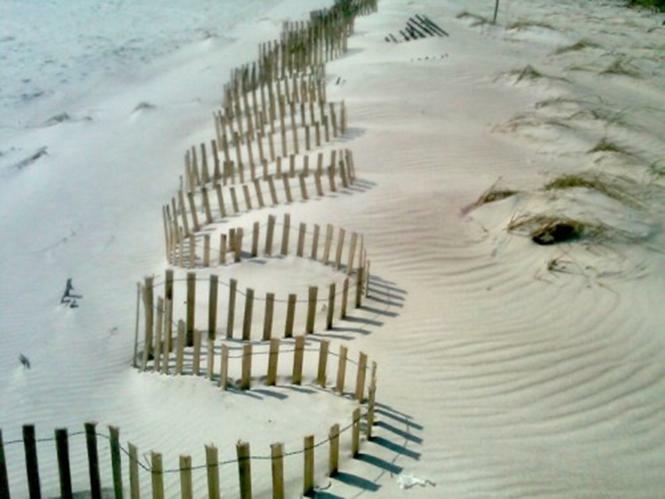 Dune fencing is ideally designed for a flat plane and will hold the sand until a second or third fencerow is required. With the addition of grass we have a proven beginning for primary dune recovery.